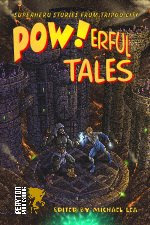 Superhero anthology Pow!erful Tales is out now from Peryton publishing - 200 pages of heroic stories including my flash fiction piece The Ironic Man. Have you gotten your copy yet? I didn't realize it was out. I also have a story in it. Not yet. I just spotted that it was available.